China has the largest high-speed rail network in the world which runs more than 4,300 miles. On Wednesday the People Daily Online announced that the Chinese high speed rail broke another record. The train called “The Harmony – CRH-380A” reached 258.86 miles per hour during a trial run between Shanghai to Hangzhou. This new registered speed was almost 13 miles higher than the earlier record that was broken back in June 2008 by a CRH3 train that ran between Beijing and Tianjin at a top speed of 245 miles per hour. The new train will be brought into service beginning in October and will run on the Shanghai-Hangzhou route. 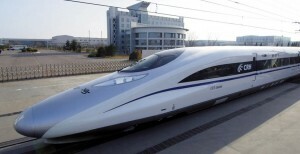 China hopes to double the amount of high-speed rail across the country by 8,000 miles by 2012. If these trains were introduced in the US, the airline industry would surely go bankrupt. The original story is posted here. Verizon iPhone 4 Breaks First Day sale record in just two hours! Next Iran acts Against Innocent Virus distributors? !